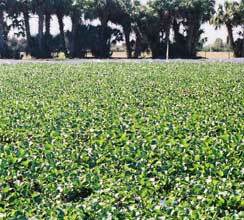 Due to their simple design and operations, Water Hyacinth Scrubber™ systems are often more cost-effective than either passive treatment wetland systems or more intensive chemical treatment systems. The WHS™ is applied in tropical and sub-tropical regions where nutrient and organic loads are relatively high. Most frequently, these are agricultural or domestic wastewaters. The WHS™ has been shown to produce annual phosphorus removal rates up to 500 pounds per process acre, with nitrogen removal rates up to 9,000 pounds per process acre.